The conference committee is currently soliciting proposals for papers, special sessions, and panel discussions relating to the conference theme. However, papers on all material culture architectural history and historical geography/landscape topics of interest to the Society are welcome. The International Society of Landscape, Place and Material Culture (ISLPMC) will hold its 49th annual conference in Salt Lake City, Utah, October 18-21, 2017. 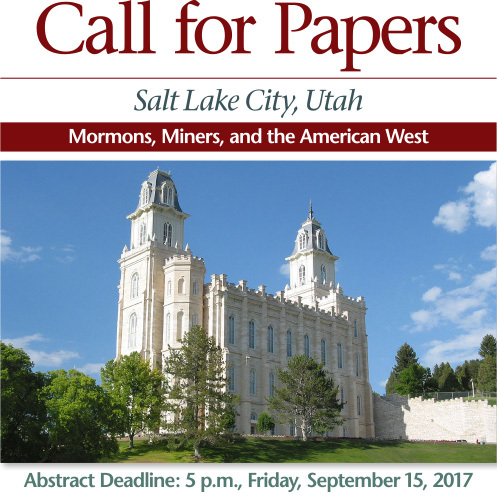 The 2017 Conference theme is “Mormons, Miners and the American West.” In 1847 the first groups of Mormon settlers led by Brigham Young entered the Valley of the Great Salt Lake. After displacing most indigenous residents of the valleys, the Mormons established the first of their many permanent settlements in the region based on the Plat for the City of Zion. They were seeking isolation following decades of persecution; however, much of the area they settled also contained some of the richest precious metals deposits in the West. Soon they were joined by others seeking, among other things, silver and gold, and introducing an array of cultural conflicts. The conference committee is currently soliciting proposals for papers, special sessions, and panel discussions relating to the conference theme. However, papers on all material culture architectural history and historical geography/landscape topics of interest to the Society are welcome. Note: Only papers submitted by ISLPMC members and registered participants will be accepted for the program. Presentations will be limited to 20 minutes with additional time for comments and questions. All presentation equipment will be provided. Abstracts must be no longer than 300 words, and include the title, name of author(s), and affiliation(s). Electronic submission in Microsoft Word is preferred. The paper session will be on Friday, October 20, 2017. Abstract submissions are due by 5:00 p.m., Friday, September 15, 2017.